Sponsor adds Extended by popular demand: -75% OFF SALE! Extended by popular demand: -75% OFF SALE! 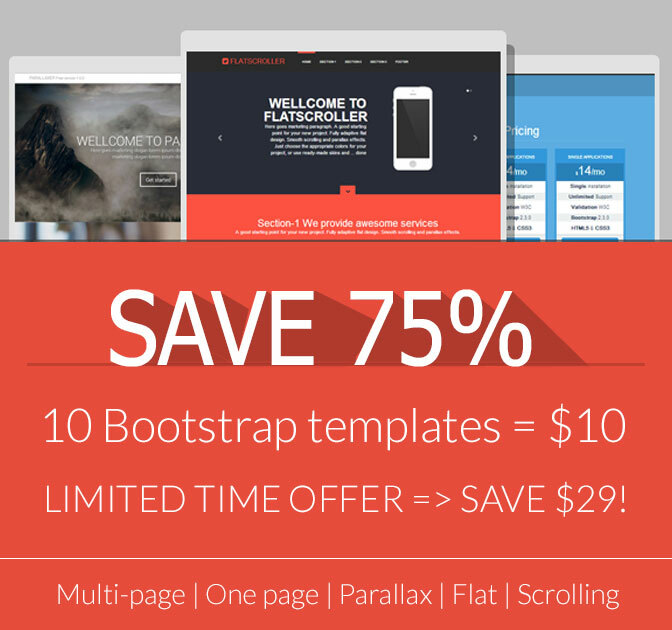 GET 10 Bootstrap TEMPLATES FOR $10! Learn more how to save $29! Ready to use responsive CTA Sections - Bootstrap 3.1. based BLOCKS gives your unlimited templates variations in right way! × These are the rules our automated upgrader takes when it upgrades your HTML. It's also a handy checklist to keep in mind if you're upgrading code manually! 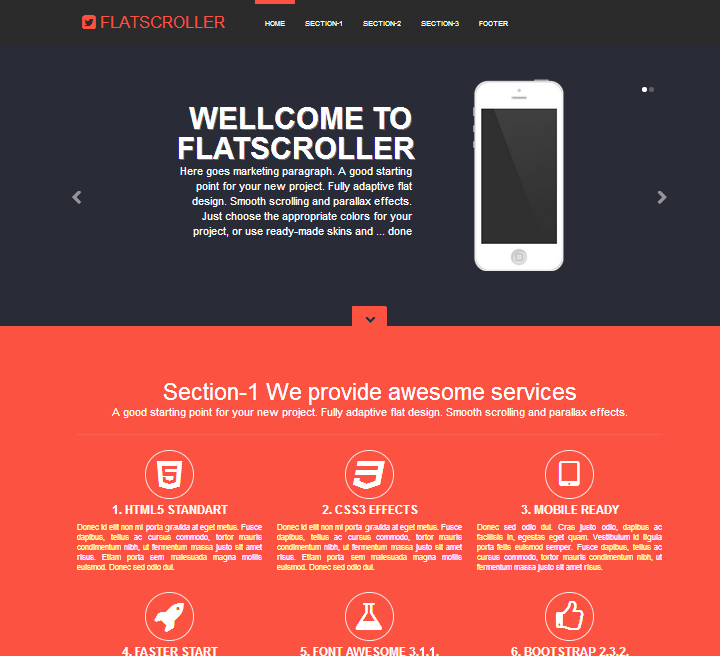 Introducing FlatScroller built with Bootstrap 3.0. version! Meet the first premium Bootstrap 3.0. template BS 3.0. now supported! Modern Bootstrap landing page flat style responsive one page scroller with parallax effect. Special price only $10 for two items: template + FlatPricing items! Bootstrap v.3.0. latest version - ultra responsive layout! Drag&Drop builder with lots of features EVObuilder provides 3 easy steps for create responsive templates in minutes. 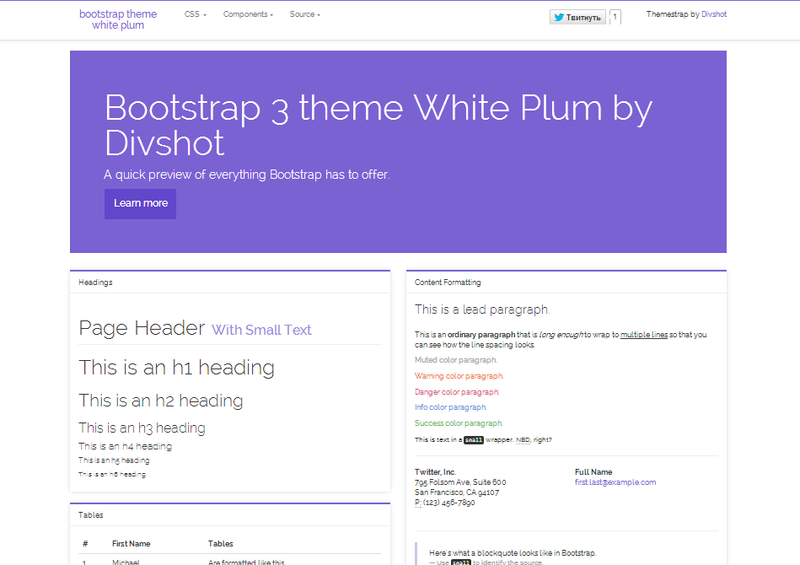 All Bootstrap 3.0. features included. Drag&Drop editor + HTML editor + Less + Css editor give you all power to build with bootstrap. Prebuild layouts & Templates. Colors preset themes build-in. Want to see working & ready to use living examples Bootstrap 3 templates, themes & examples, Bootstrap 3 Wordpress themes? Subscribe to the special Bootstrap 3 version newsletter by Bootstraptor.com and be the first who will get it! The icons, now .glyphicon are in a separate repository. Include .glyphicon base class in all icons (ie: .glyphicon .glyphicon-asterisk). 10 Premium Responsive Bootstrap Templates - only $10! 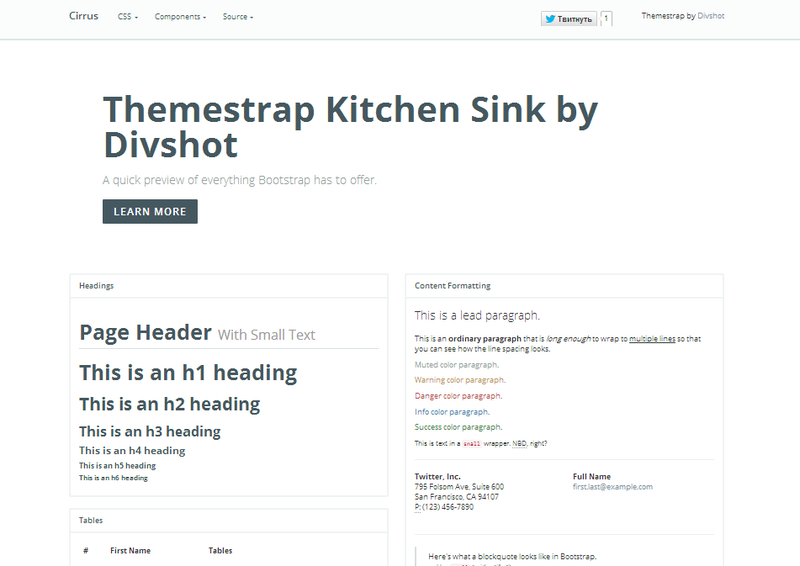 This Bootstrap 3 themes Copyright 2013 @Divshot, Inc. under the Apache 2.0 license. Bootstrap 3.0. version templates is coming through 1-2 days on Bootstrator.com Stay updated! Special Offer! Reduce the price of one week, now only $6! VERSO v. 1.0. Bootstrap responsive modern multifunctional business template. 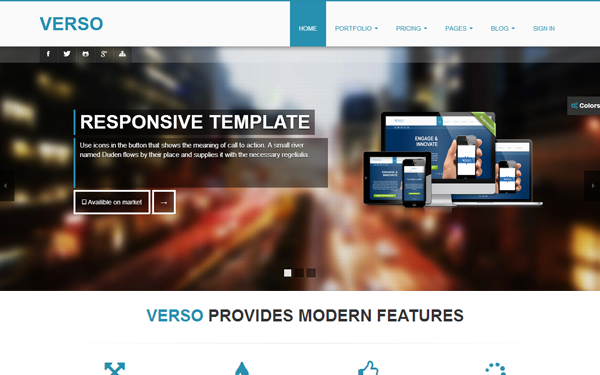 VERSO is a Responsive, HTML5/CSS3 Bootstrap 2.3. template that features a clean and slick design that is suitable for a wide variety of websites. Special Offer! Special price for 1 week only $8 Parallax one page Twitter Bootstrap template with smooth scrolling/touch on tablets and phones! 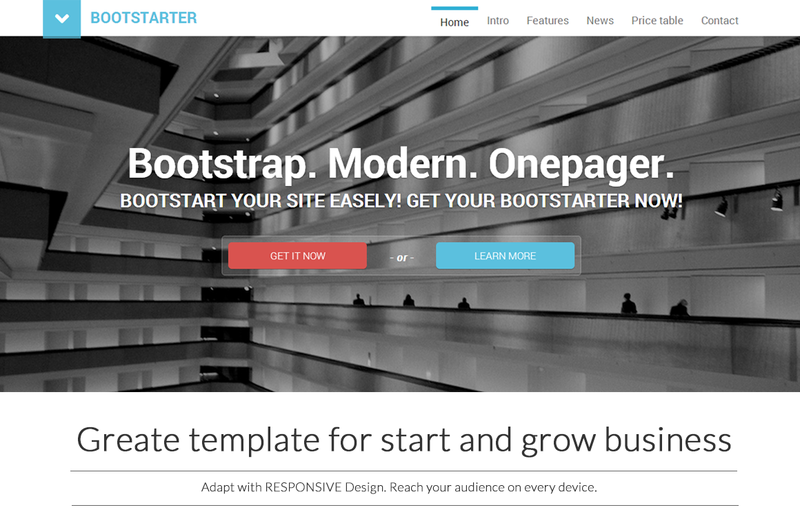 Easy start your site with BootStarter! Introducing FLAPPSTER! Bootstrap responsive flat style landing page for promote your apps, products & projects. SPECIAL HOT SUMMER OFFER! - 50% OFF! LIMITED TIME! RP $20 - NOW ONLY $10! SAVE $10 ! Introducing PARALLAXER NEW! Modern Bootstrap business template - responsive one page scroller with parallax effect. Special offer for one week, the price has been reduced and now only $6, the standard price - $14, Your savings $8!!! Special Offer! Special price for 1 week only $6 Modern Bootstrap landing page flat style responsive one page scroller with parallax effect. Special price only $6 for two items: template + FlatPricing items!